Topics: Accommodation, Plettenberg Bay, Activities, Directions, and Acadia Bed And Breakfast. 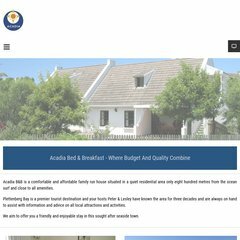 acadiaguesthouse.co.za Acadia Guesthouse Plettenberg Bay Bed and breakfast accommodation ..
acadiaguesthouse.co.za Acadia Guest House in Plettenberg Bay in the Western Cape, on the ..
acadiaguesthouse.co.za Bed and breakfast Plettenberg bay Acadia Guest House Garden Route ..
acadiaguesthouse.co.za Plettenberg bay Activities Acadia Guest House in Plettenberg bay ..
Acadiaguesthouse.co.za's IP address is 188.40.0.144. Its 3 nameservers are ns3.second-ns.de, ns.second-ns.com, and ns1.your-server.de. It is hosted by Hetzner Africa (Bayern, Gunzenhausen,) using Apache/2 web server. Pinging the server, resulted in a 119 ms response.